Die Co. U-clips are easy to install and hold panels securely. Die Co. U-clips can fasten two or more metal, plastic or wood panels, preventing them from vibrating or separating. Designed for quick, tool-free installation, U-clips easily slide over multiple panels. The two spring steel legs maintain a constant pressure against the joined panels. Optional barbed legs can enhance gripping power. No screws, rivets or other devices are needed to secure U-clips. They are a self-sufficient, low-cost, reusable fastener. 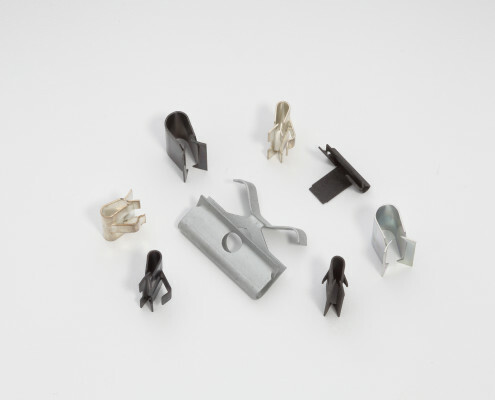 Browse the selection of Die Co. U-clips in our product catalog, contact us to customize a U-clip for your application or check for a competitor part on our cross reference list. Learn more about Die Co. U-clips and find part numbers in our product catalog or check for a competitor part on our cross reference list. Email a Die Co. representative – or call 440-942-8856 – and tell us what you need. One of our fastener experts can help you find or design the best U-clip for your application.